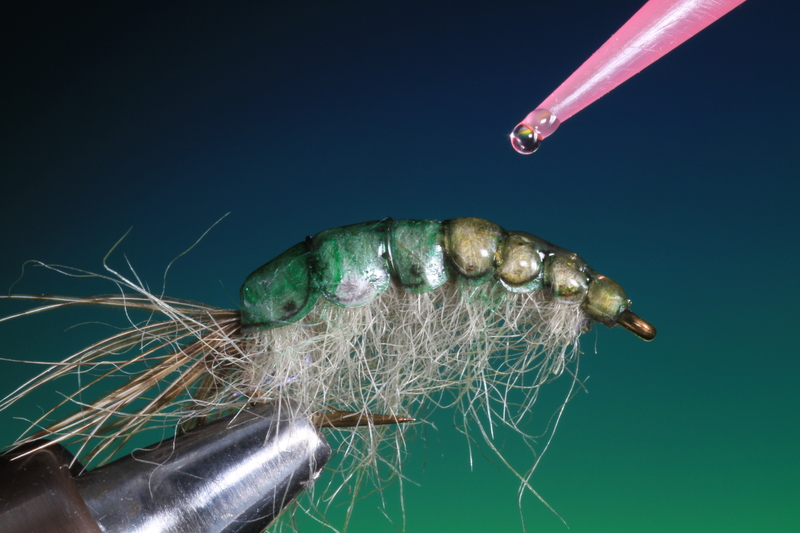 The reverse foil Gammarus by popular demend! 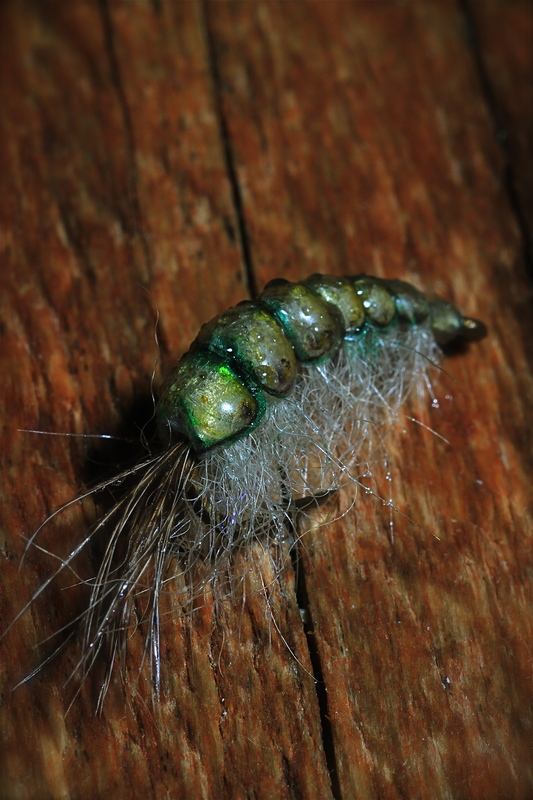 I cant really say much about this pattern as I only designed it and tied it up a couple of hours ago while playing with the new Shrimp Foils. 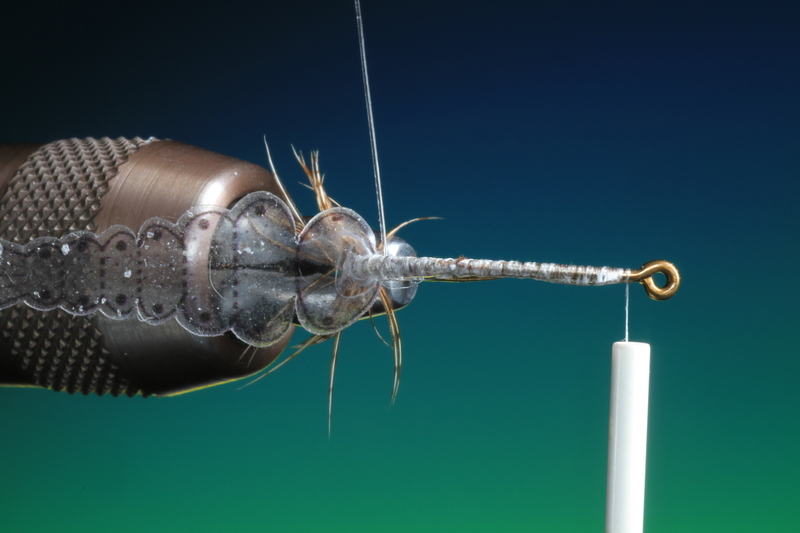 But I could see right away when I started messing around with them that if I tied the foil onto the hook in reverse it could possibly bee a decent gammarus shell back! 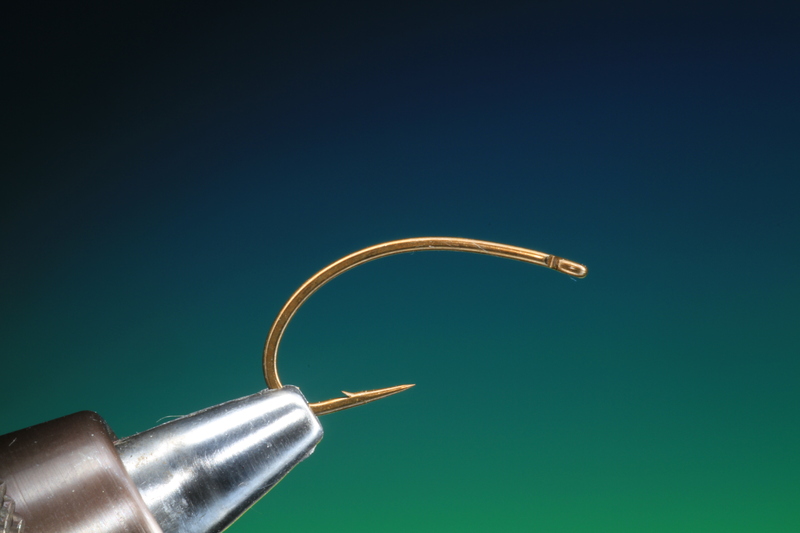 Secure your Mustad C49SNP hook in the vice as shown. 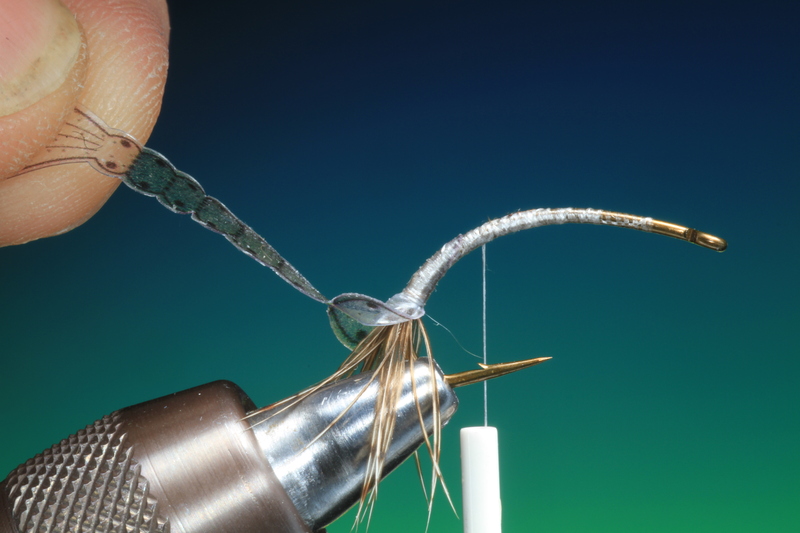 Cover the hook shank with tying thread and tie in a partridge hackle at the base of the bend. 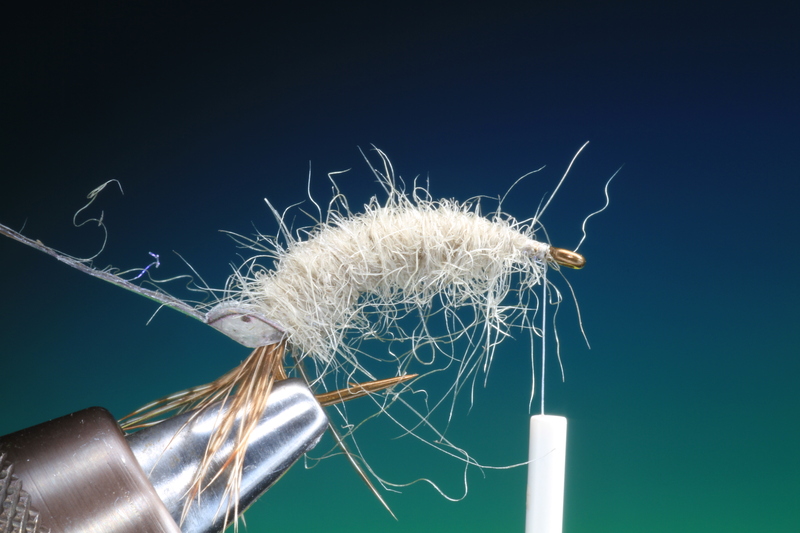 Wind on the partridge hackle revers wet fly style. Now tie in the shrimp foil the head first. 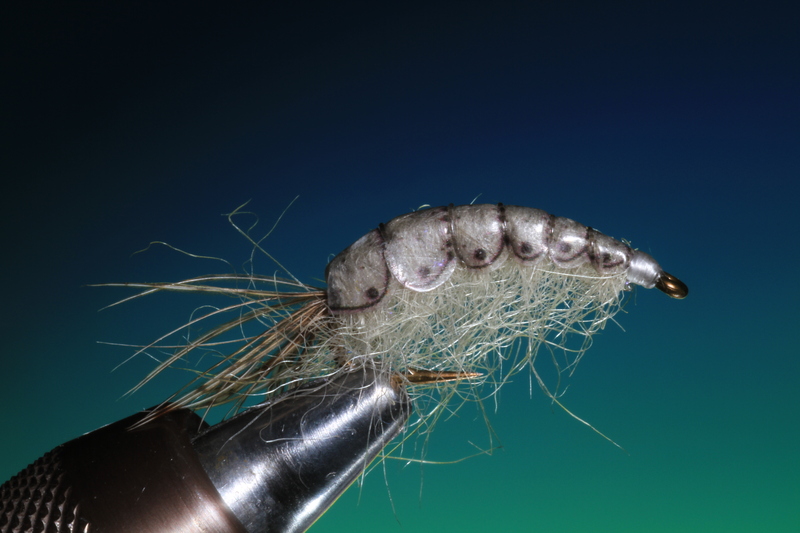 Leaving just enough of the foil head plate for the gammarus head shield. Heres a view of step 5 from above. 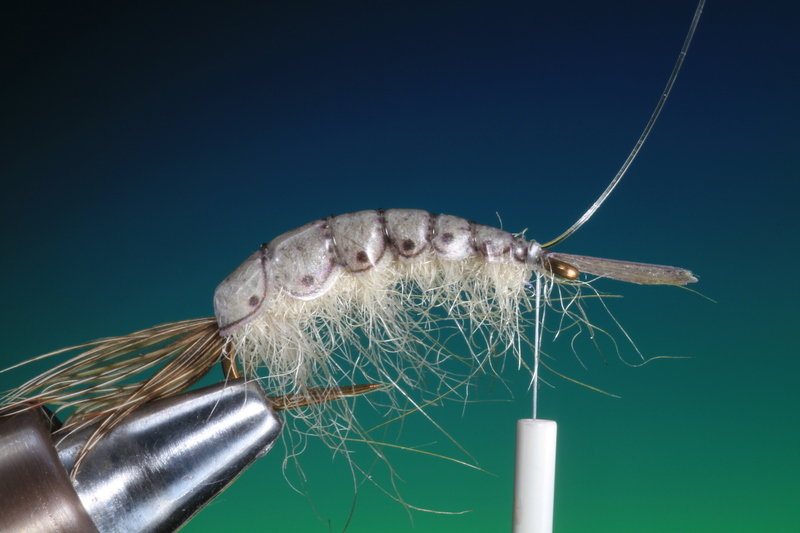 Tie in a length of clear mono for the shrimp rib. 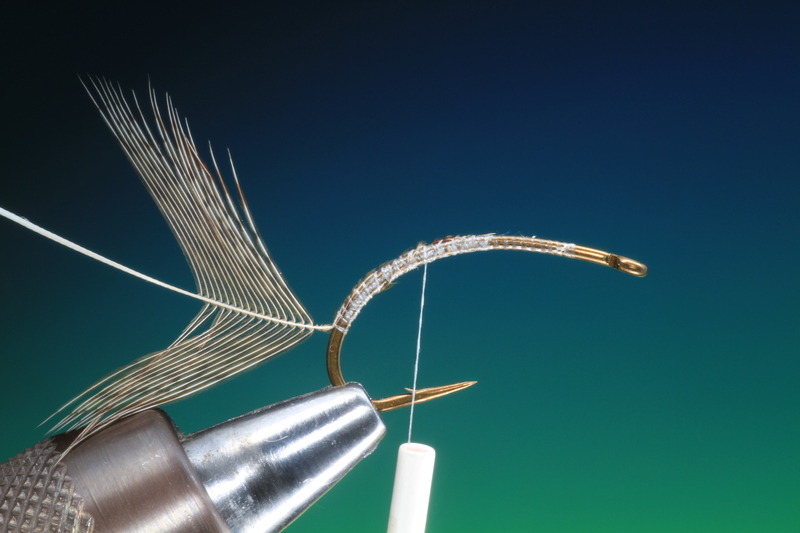 Now you have to spin some seals fur dubbing onto your tying thread. Begin dubbing at the hook eye and work your way back to the shrimp foil. 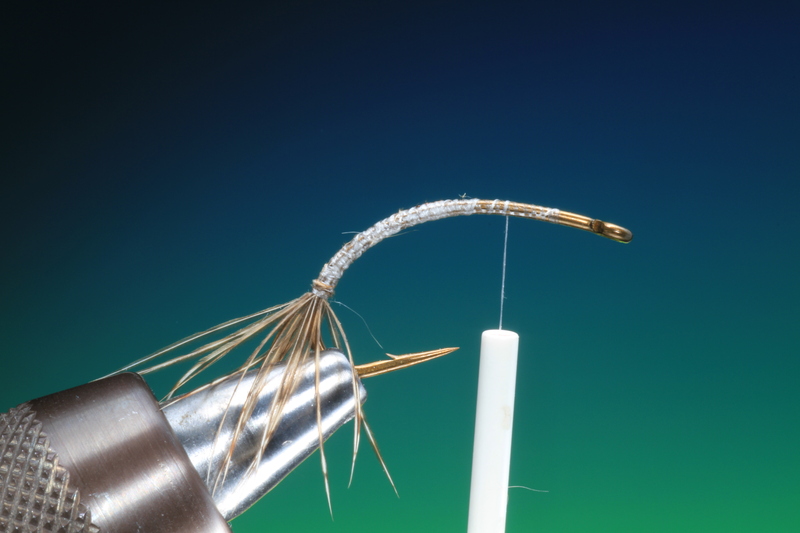 Make sure that you taper the dubbed body, thicker at the bend of the hook and becoming thiner towards the hook eye. The dubbing shouldn’t be wound too tight. 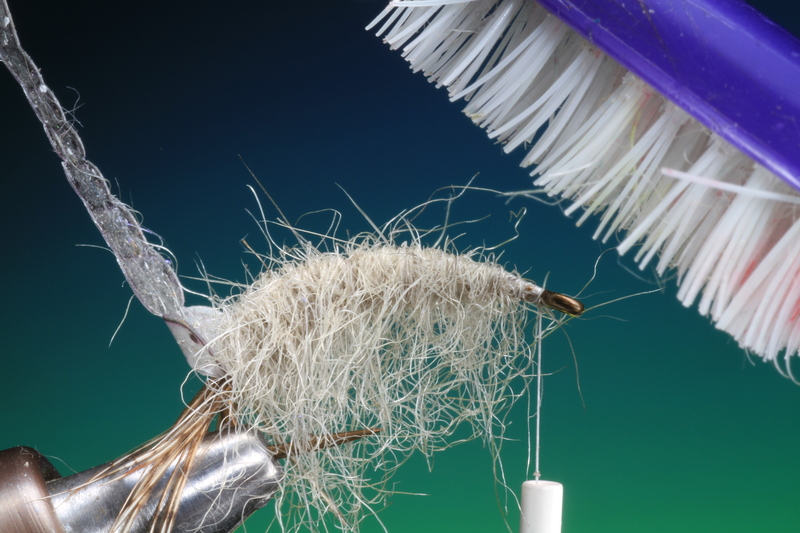 Once the whole body is dubbed brush out the fibers with an old tooth brush to form the legs. Fold over the foil and make a couple of turns of tying thread just behind the hook eye to hold it in place. 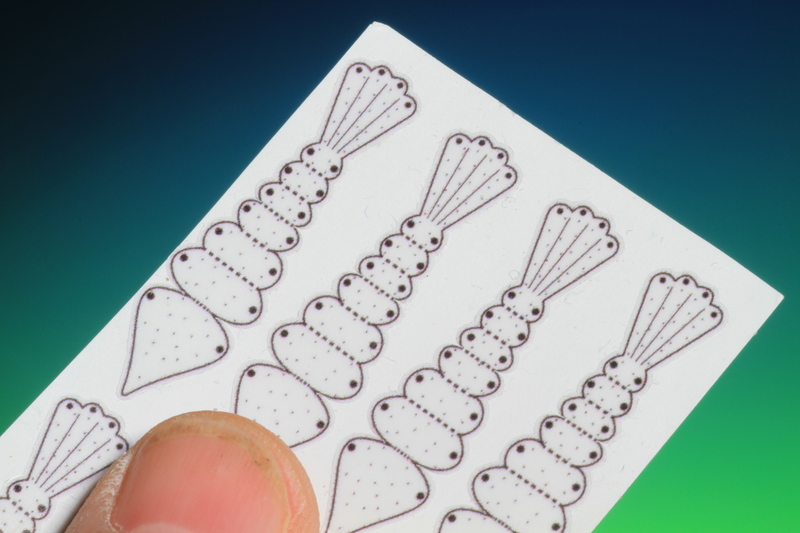 Once secure you can wind on the mono rib one turn for each marked segment of shrimp shell. Tie off. Remove the excess foil and mono and whip finish. 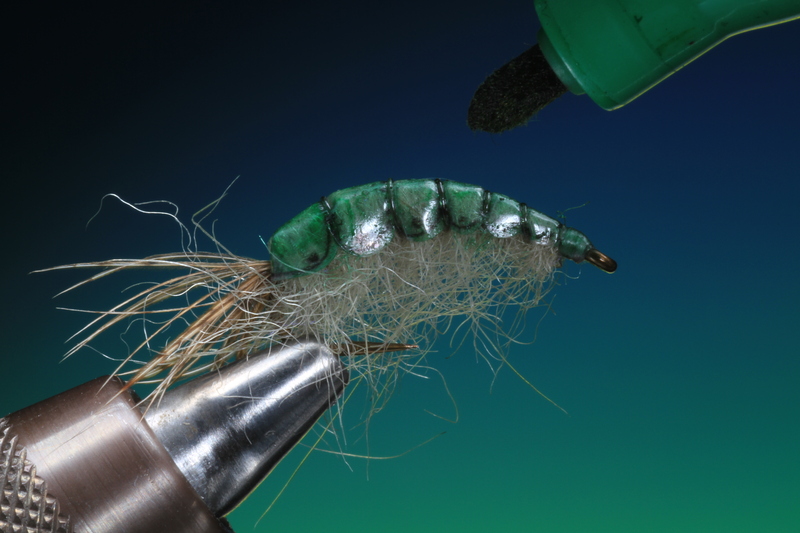 If wished you can now colour your gammarus with a water proof felt pen. This will highlight the shell segments. Carefully coat each segment with Bug Bond and cure with the UV light. 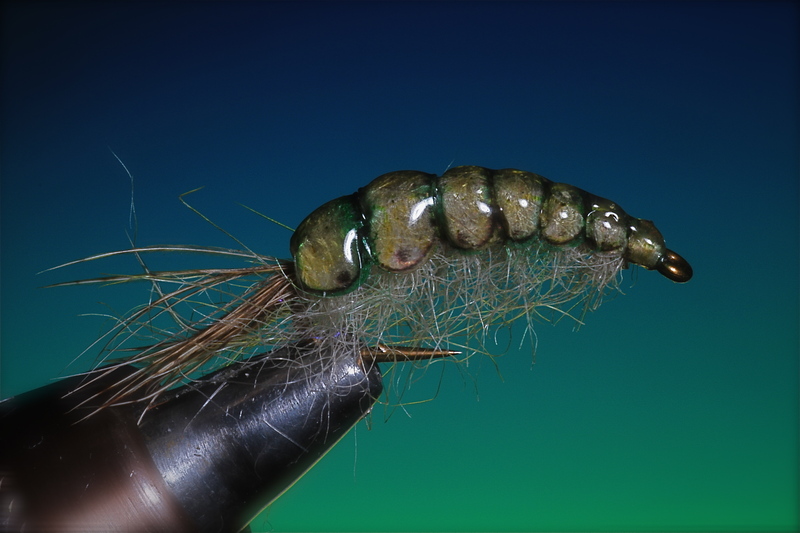 There you have it, the finished Reverse foil Gammarus.